Overall we had a great experience great service at Sabbia.we really enjoyed our stay everything was as expected beautiful place we enjoyed it so much reccomended 100% and for sure we will do it all over again very soon!the location especially we loved it. We enjoyed our stay at the Sabbia very much. Friendly people, very close to 5th Avenue and all the excitement with the shopping ,restaurants and excitement. Beautiful pool and beaches close at hand. 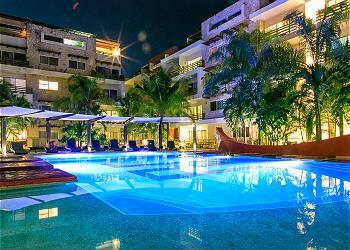 The staff of Playa Moments were attentive to our needs and did all they could to make our stay enjoyable. Luna was our main contact and she was amazing with all her duties still found time to make sure our needs were met. Our only regret was the construction of other condo's be built adjacent to where our unit was .Got very noisy and a lot of dust at times. Of course Playa Moments had no control over that situation and did what they could to minimize the negative affect to us. All and all we had a great time and have booked another 6 weeks for next year. This was our first time in Playa del Carmen and we enjoyed it as anywherelse. The apartment is fully equipped and has all we needed to spend a nice time there. My family was impressed of how cleaned was and for te attemptive service that Playa Moments' staff offered us! The rent included all services, an excellent wi-fi connection which was helpful as I had to work few hours during the afternoons. Bedrooms with en suite bathrooms results as privacy to all of us, each with its own space and all together when ready to go out! It was an amazing experience we will surely do again soon! Thank you Playa Moments for your great service and responsive team! Todo estuvo muy a gusto, las habitaciones muy amplias, el departamento en muy buen estado, la alberca perfecta. El único detalle fue que el Internet no funcionó y lo reportamos en persona pero nadie fue a revisarlo ni a arreglarlo. Fuera de eso todo lo demás estuvo de maravilla. Hi Shelly, thank you so muchh for your evaluation and comments, we are happy to see you can enjoy your holidays with us. We tried always to take care of our guests make them feel confortably as at home by providing first choice amenities and excellent services! We hope we get the opportunity to host you again soon! Warm regards from playa Moments' team! Disfrutamos mucho nuestra estancia, el departamento es muy bonito, amplio y cómodo. La ubicación es perfecta a solo una cuadra de la 5 Av. We had a wonderful time at the Sabbia condo, but Victor is who made it even more enjoyable. He was extremely helpful in all aspects of our vacation including booking excursions, transportation, where to eat, where to exchange money, and anything else we needed. He does an amazing job! Great: quiet and clean pool to enjoy the sunshine, walking distance from the beach and the main tourist street (with bars and restaurant) and a underground private parking garage. Awesome! Hi Matthijs, thank you for your kind comments and evaluation, we try our best to offer the best service possible in order for all our guest to be able to enjoy a worry free vacation. We certainly hope we get the opportunity to welcome you back soon. Kind regards from the Playa Moments team!